Michelle practices general insurance defence litigation. Her practice includes the defence of personal injury claims, product liability claims, and property damage claims. She represents businesses, professionals, health authorities, educational institutions, and other public bodies. Michelle began her practice in a boutique Vancouver law firm, focusing on personal injury and estate litigation. During that time, Michelle also provided pro bono and legal aid services to those detained under the Mental Health Act. Michelle has appeared at all levels of court in British Columbia. She has also appeared before the Mental Health Review Board on numerous occasions. Michelle joined Guild Yule LLP as an associate in 2018. 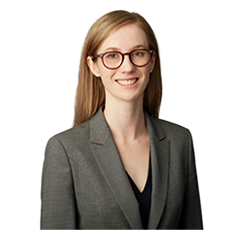 She currently serves on the executive committee of the Young Lawyers and Civil Litigation sections of the Canadian Bar Association, BC Branch.